Kung Hei Fat Choy!! 恭喜發財!! Welcome to the Year of the Sheep!! I don't know about y'all but it's been a busy few days of cooking for us. Lots of delicioso type of traditional Chinese New Years dishes that we make once a year to celebrate the coming of the New Lunar Year! Yummilicious things like Chinese Sweet New Year Cake 年糕, Steamed Radish Cake 蘿蔔糕, and the Braised Dried Oyster with Black Sea Moss 髮菜蠔豉燜燒肉. One of the things we made for the first time this year is Homemade Chinese Pork Jerky, also know as Bakkwa, or 自制猪肉干. The reason we attempted to make our own jerky is because we received a most beautifully illustrated cookbook to review, Chinese Feasts & Festivals: A Cookbook, by S.C. Moey, and we were delighted to discover what looked like a pretty easy recipe for making this delicious treat at home. I mean I love chinese jerky and never realized you could make it yourself at home! 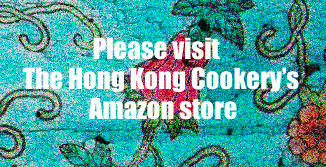 Happy Valentine's Day from all of us at The Hong Kong Cookery! Our Valentine to you, dear readers! 情人節快樂! I'm always so happy when I get a chance to write about Macau. It's a place that pulls me in some way, there's something so interesting about this little city that started out as one of the first European trading port cities in Asia and now, 500 years later, is a gracefully beautiful yet contradictory grand dame, full of sometimes shocking flirtations and many, many secrets doors into her long, intricate past. One very interesting part of this past of Macau is the ethnic group known as the Macanese otherwise known as the folks who are/were born with Portuguese and Macau ancestry. ( Macau was for a long, long time a Portuguese colony. ) The Macanese developed the eclectic original fusion food known as Macanese Food, a mix of Portuguese and Chinese cuisine that is very distinctly their own. We were reminiscing eagerly about Macau today and about how much we missed the delicious food there and oh, we should make a short trip soon, blah, blah, blah. Long story short, what else to do to stave off our cravings but to make this yummilicious Macanese Style Portuguese Curry Chicken Portuguese chicken, a dish unique to Macau and Macanese food!